SOUVENIRS — Samantha Johnson’s slogan, “Be Better,” is displayed on wristbands that she will hand out after her speeches to young athletes this year. 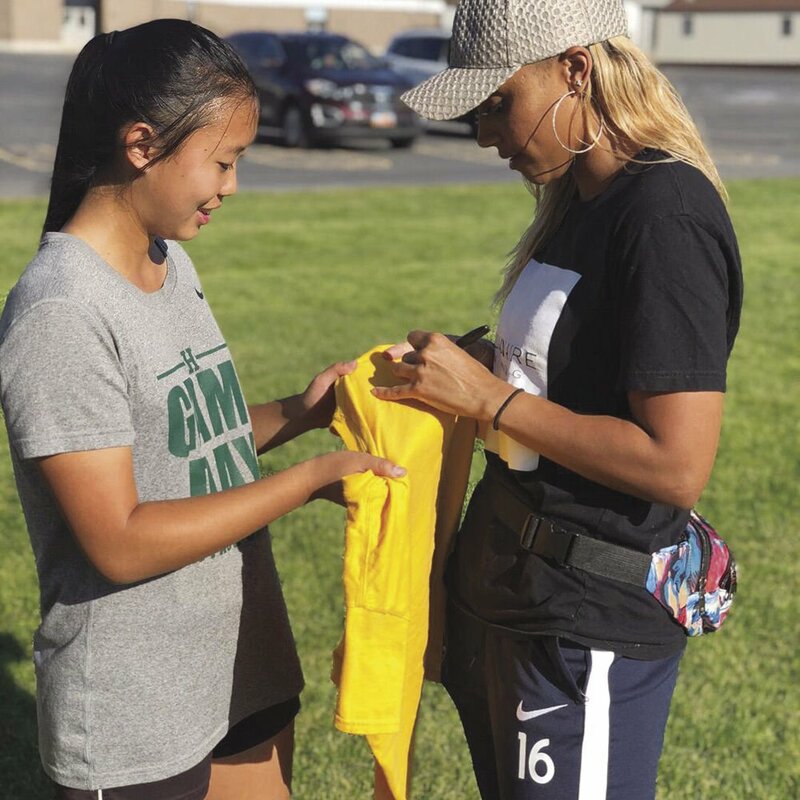 AUTOGRAPHS — Highland grad Samantha Johnson, who plays professional soccer for the Utah Royals in the National Women's Soccer League, chats with a fan. BATTLING — Highland grad Samantha Johnson battles for the ball while playing for Melbourne Victory in Australia. Johnson plays for the Utah Royals in the National Women's Soccer League. Most people have already abandoned their New Year’s resolutions by now, but professional soccer player Samantha Johnson is hoping she can reach young athletes and challenge them to “Be Better” this year and beyond. The Highland and USC grad has been playing professional soccer for five years and has been doing volunteer work with youth during that time. Last year, she decided to make her own campaign to share with today’s youth. “I always say, ‘Be better,’ hilariously, because if someone makes up an excuse about something or whatever, I’m just like, ‘Well, maybe you should just be better,’” Johnson said with a laugh in a phone call from Australia in December. She started to think about that phrase, “Be better,” and realized how simple and inspiring the message is. She practices it in her life and wants to share that with young people to help them on their path. “Hopefully enhance the youths’ perspective on just having more self accountability and confidence in themselves,” Johnson said. “Looking in the mirror first — not looking to others to solve your problems. You just be better. Johnson will be doing a tour around Utah schools, where she plays for the Utah Royals in the National Women’s Soccer League. She plans to give out wristbands with the motto on them. Then, she hopes to come home to Palmdale to share her message with the people she calls “my youth.” Johnson said she is hoping to come to the Antelope Valley in June during the NWSL break because of the Women’s World Cup. “I’ll come do a soccer camp with my old club that I used to play for out there (Cal Elite),” Johnson said. After a successful high school soccer career at Highland, Johnson played for USC, where she had more success. She graduated from college in 2013 (with a degree in sociology and a minor in occupational therapy) and decided to give up the sport she had played since she was 5. She spent a year living in Los Angeles, doing some modeling and working bottle service at a nightclub. Then, in 2014, one of her best friend’s convinced her to go to an open tryout for the NWSL’s Chicago Red Stars. She unexpectedly made the team. She played for the Red Stars until last year when she was traded to the Royals with about two months left in the season on June 18. When she was first in Chicago, she found opportunities to volunteer and work with youth. Then, she decided she wanted to inspire young girls, but not necessarily in a soccer setting. “I’m always around soccer and I wanted to do something that was a little bit different with any girls organization and schools and stuff,” Johnson said. She wasn’t sure how to get started, so she decided to contact schools in her area. After their initial shock, the schools invited Johnson to come and loved the message she shared with the students. After being traded to Utah, she found a school there to continue to inspire youth. Now, she will get to spread her message at many schools in Utah. She also will be going to London to kick off her campaign at a school there. When she’s not playing soccer for the NWSL, Johnson plays in the Australia W-League. She is in her third year playing there. She played her first season with Sydney FC in 2016 and is finishing her second season playing for Melbourne Victory. Johnson will return to the states on Feb. 28 and preseason for the NWSL starts on March 2. Even though she admitted she didn’t like soccer until two years ago, Johnson always stayed committed to the sport, because she was talented at it and knew it could take her places. She is one of the shining examples that with hard work you can succeed at a professional level if you’re from the Antelope Valley. “Don’t let your surroundings be your limitations,” she said.